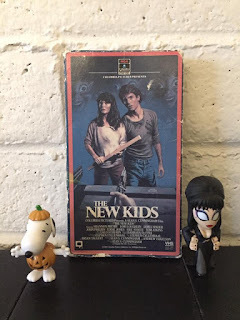 The Horror Movie BBQ: 5 More Awesome VHS! 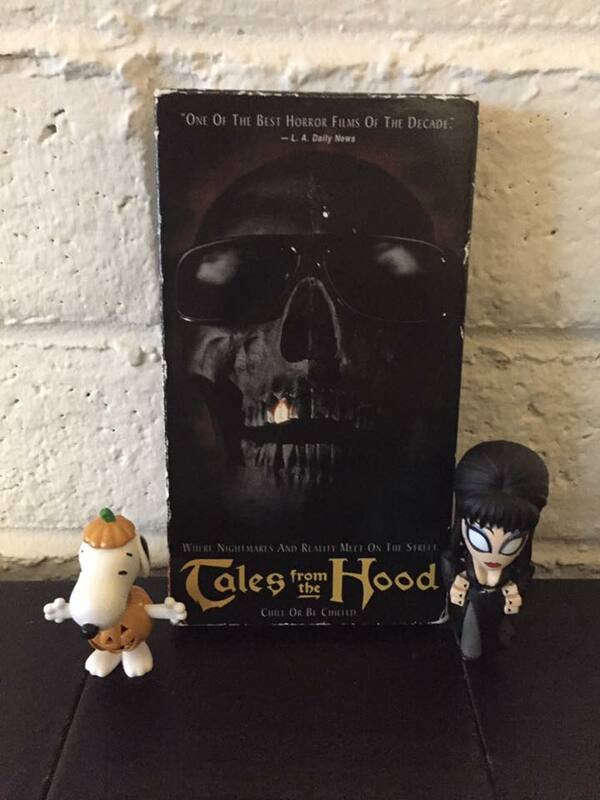 This movie has been sought after it's dvd release became out of print and not getting any form of rerelease in the years since. 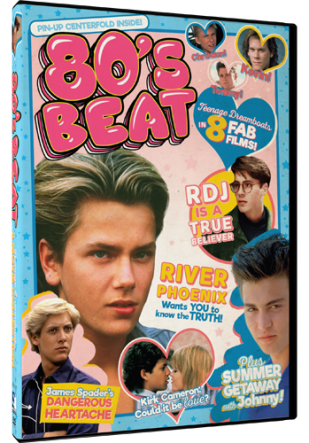 But thankfully, our friends at Scream Factory will be releasing a special edition BluRay this coming March. Considering how long fans have waited, it's long overdue and I get the sense that a lot of fans will be willing to consider it "release of the year" nominee. I discovered this late in life, thanks to Bravo's 100 Scariest Moments in 2004 and I'm very happy I was exposed to it. Rutger Hauer as a creepy hitchhiker who seems so obsessed with making C Thomas Howell's life absolutely miserable. Through multiple mind games and a finale that will make you gasp, this really pulls you in. Now, the odd part is the fact that this movie hasn't gotten a lot of love in the past few years. 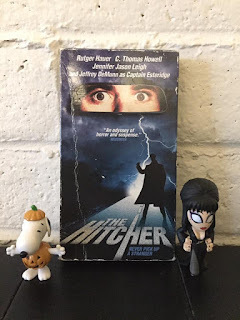 Personally, I'd love to see a figure of Rutger's character to put on my shelf. On top of that, a bluray release would be fantastic as we haven't received anything past the dvd released about 15 years ago. Gotta liven it up. Two real intense and dark movies, I gotta get a quick pick me up and put me in a lighter mood and what better to do so than GI Joe? 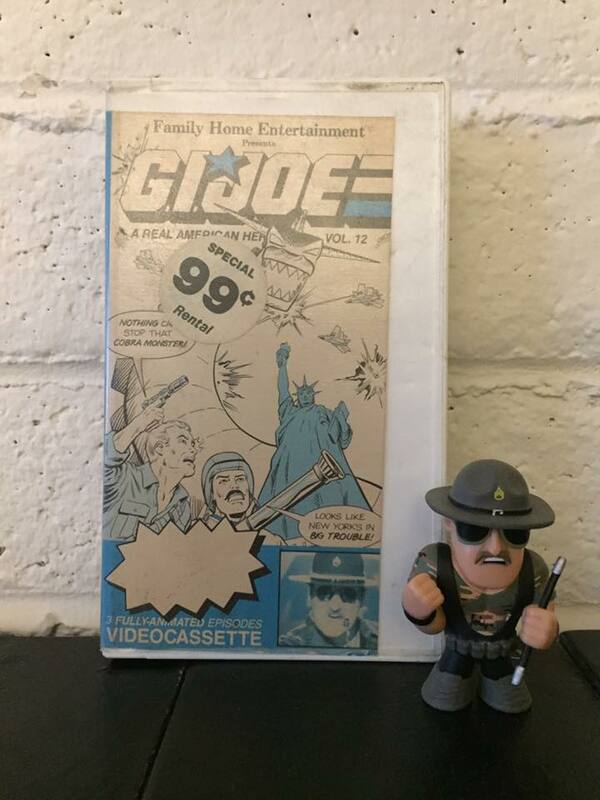 Containing 3 of the best episodes Sunbow had to offer, the real draw is the live action segments featuring Mr GI Joe himself, Sgt Slaughter, who was clearly taking a break from defending America from Mr Fuji or something, to introduce the cartoons on this tape from what seems to be my back yard. Not fooling anyone, Sarge. You're just filming these at the YMCA summer camp down the road, aren't you? Ok, you can watch the cartoons anytime. 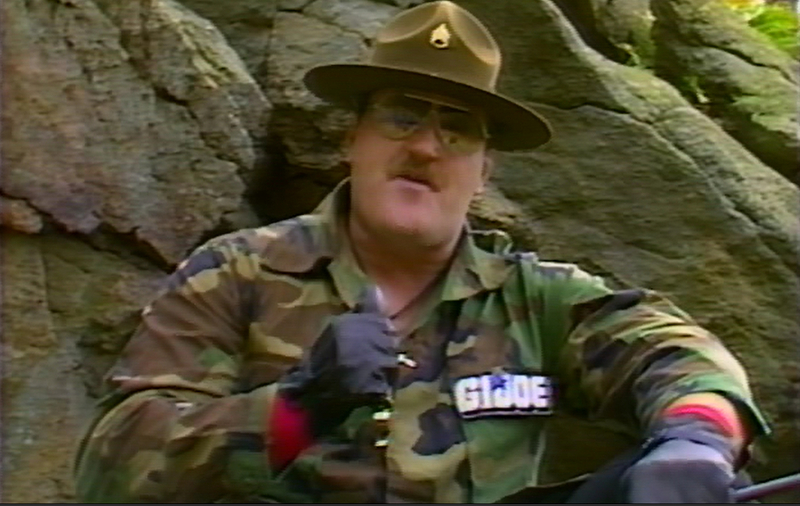 But seeing Sarge acknowledge the continuity of the show was something else. 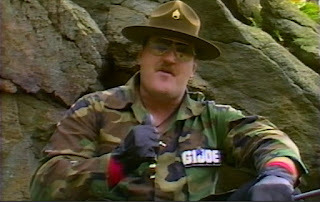 Sarge plays the VJ so to speak and drops a witticism or two, gives us a preview and then throws it to the action packed episode. The segments themselves are so incredibly 1980's in nature in both the lines Slaughter spouts and the filming. But is it a nice comfort tape to watch when I need a quick pick me. Oh boy. This is such a gem. 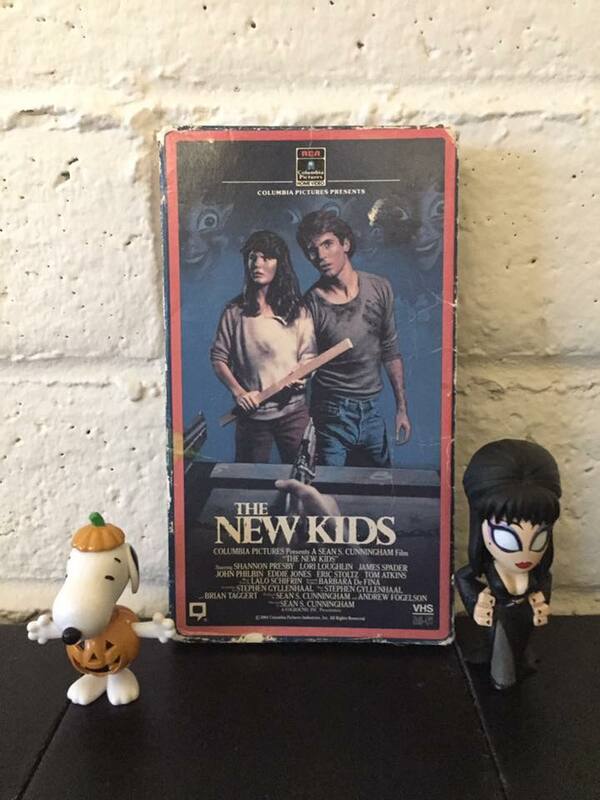 The New Kids is about Lori Loughlin and Shannon Presby playing two military brats who just lost their parents in a plane crash, so they move to a small town and are soon menaced by the local bully, Dutra, and his hillbilly friends. Dutra is played by James Spader who plays it so well that it makes this movie my all time favorite role of his. On top of that, the cover just looks so cool. Definitely one of my favorite covers and one that sums up the era, if you ask me. 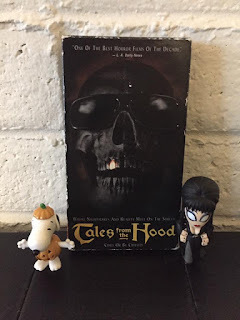 This is again a case of a movie that a lot of fans love but there has yet to be a solo bluray release. Mill Creek has released it apart of an 80's compilation on dvd called "80's Beat" that features other fun movies from the time, but it's inclusion of New Kids is truly what makes this set worth picking up, which you can do here. If you follow me on Twitter, you'll know that I still watch SNL every week and live tweet it with the likes of Corey from The Chap Report and the famous William Bruce West of WestWeekEver. Yes, we may be the last three fans in existence of the show despite it's ups and downs. Nothing like a bunch of nerds in their mid to late 30's complaining about a 40 year old show but I've been watching for over 20 years and I don't see giving it up anytime now. I still look forward to it! 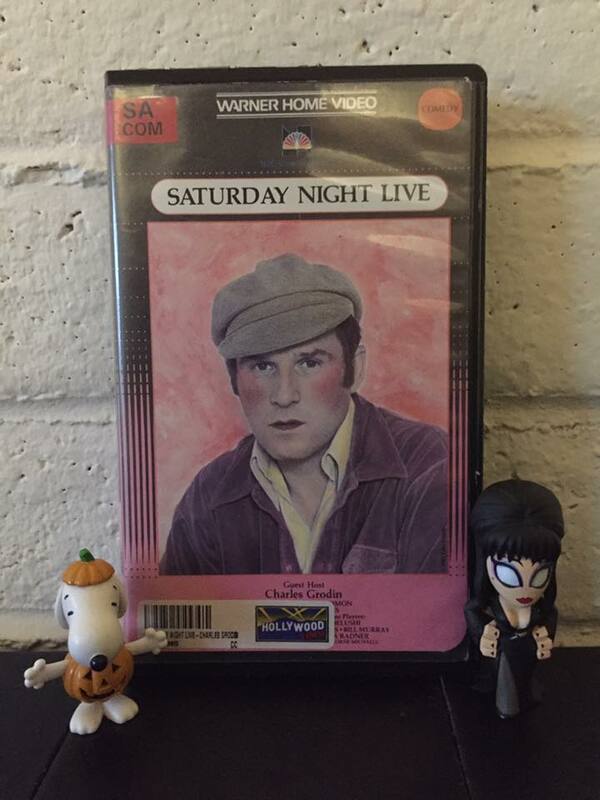 One of my favorite episodes is the infamous episode from 1977 that features Charles Grodin stumbling through sketches with virtually no rehearsal time and it shows. Yes, they centered an entire episode around the idea that Charles just couldn't be bothered to rehearse sketches. It gets really strenuous and very uncomfortable at times but for SNL enthusiasts, that's what we look for. It's such a deliciously terrible car crash that even Paul Simon gets irritated with him in hilarious fashion. I'm not gonna lie, I totally have that on my tv theme's playlist. Don't judge me! By now, I've already plowed through my snacks and tapes so it's time to get out of bed and actually do something meaningful. Maybe I will just walk down to the mailbox and see if any coupons for Arby's or something. Now I want curly fries. So until next time, keep that VCR warm!